Burned areas in boreal Eurasia are likely to be underestimated, which implies that the atmospheric transport of fire-emitted pollutants, such as black carbon particles, have larger impacts on global warming than currently thought. A study led by Chunmao Zhu, Postdoctoral Researcher at the Japan Agency for Marine-Earth Science and Technology (JAMSTEC: Asahiko Taira, President), demonstrated this based on a validation of burned areas using ultra-high-resolution images from commercial satellites. Boreal Eurasia is a region in which large areas of land burn every year. Wildfires in Russia are one of major sources of black carbon, which accelerate global warming. The moderate-resolution imaging spectroradiometer (MODIS) is generally used to estimate fire emission products; however, its moderate resolution of 500 m results in uncertainties. As a new approach, scientists carried out a size-dependent validation of the MODIS data with reference to data from three commercial satellites, RapidEye, WorldView-2, and GeoEye-1, which provide ultra-higher resolutions of 2–5 m, as well as Landsat 7 satellite data with a high resolution of 30 m for six ecotypes over 12 regions of boreal Eurasia in 2012. During the year, the area experienced severe wildfires, while the sea ice extent in Arctic reached a historic low. They now suggest that the MODIS data presents only 13% of burned areas in croplands because of the inadequate detection of small fires in areas smaller than 100 ha. In other words, 87% of burned areas have yet to be validated. These results indicate that burned area data and quantities of pollutants such as black carbon require revision, and should be reflected in simulation models of global warming. New insights will be introduced for discussion at the Arctic Council and the Intergovernmental Panel on Climate Change (IPCC). This study project was supported by the Environmental Research and Technology Development Fund (2-1505) of the Ministry of the Environment, Japan. The above results were published in Scientific Reports on July 5, 2017 (18:00 JST). Figure 1. Distributions of 12 validation regions in boreal Eurasia over a wide range of vegetation types. High-resolution satellite products, Landsat 7 ETM+ reference images, are numbered in black. Reference images from commercial satellite products are numbered in red. Only the major vegetation types studied in this work are labeled. The vegetation type data are from the MODIS MCD12Q1 product. The figure is created using QGIS 2.14.0 (http://www.qgis.org). Figure 2. MODIS detection rate of burned areas in major vegetation types in northern Eurasia during 2012. Burned areas detected by ultra-high- and high-resolution satellite images (RapidEye, WorldView-2, GeoEye-1, and Landsat 7) are used as the true values. 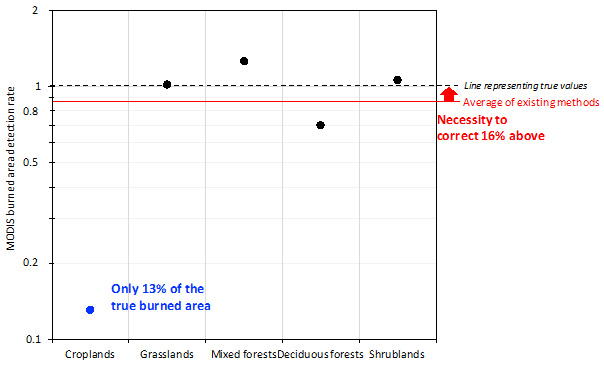 The figure shows that existing methods detect only 13% of burned areas in croplands compared to the true values. Over all ecotypes, the actual burned area in boreal Eurasia (15,256 km2) may have been ~16% greater than the area suggested by the MCD64A1 (13,187 km2). Figure 3. Comparison of burned areas in croplands detected by the MODIS sensor with those detected by the high-resolution satellite Landsat 7. 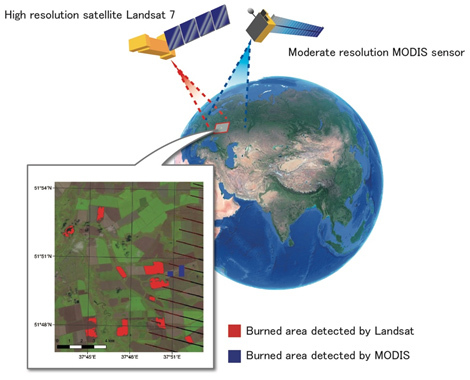 The MODIS sensor can identify only a part of the burned areas detected by the Landsat 7 high-resolution data. The enlarged view is the southwestern part of Russia labeled as area 1 in Figure 1.